People seem to dislike when the weather changes abruptly, as if it’s a cruel joke played by Mother Nature, and I get the impression that everyone thinks there own weather is more unpredictable than others’. Nate Silver and Reuben Fischer-Baum of fivethirtyeight.com recently analyzed temperature, precipitation, and severe weather data from Weather Underground to determine which city has the most unpredictable weather in the United States. They concluded that the Great Plains and the Upper Midwest have the most unpredictable weather, while Florida, the west coast, and Hawaii are at the other end of the spectrum. I wanted to reproduce their basic analysis but with a simpler approach and easier-to-obtain data set, and I also wanted to complete the full analysis in R.
First off, I collected data from the Average Daily Temperature Archive at the University of Dayton. 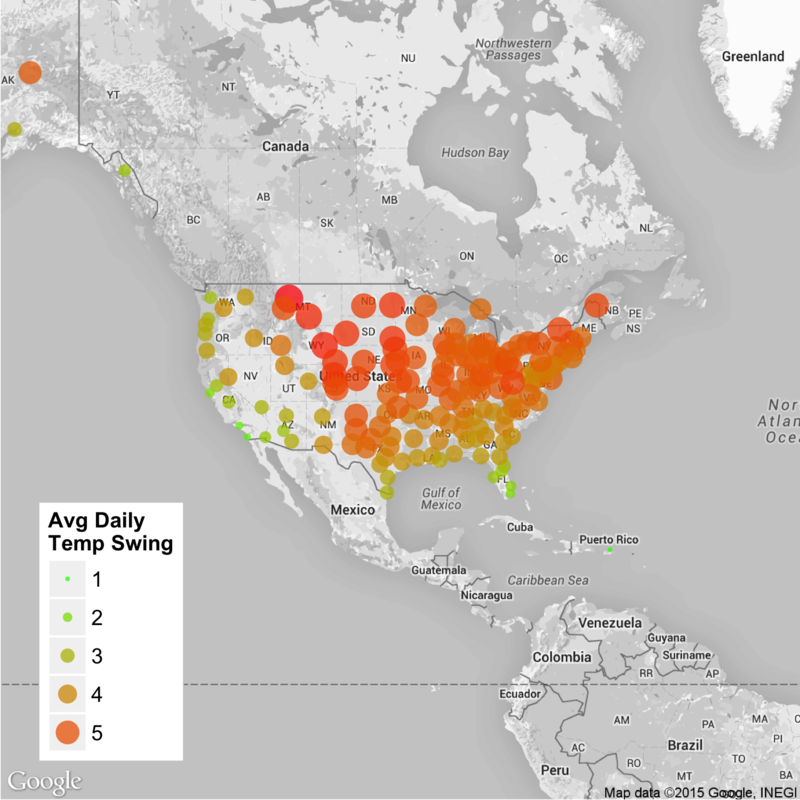 For over 150 locations in the United States, including Hawaii, Alaska, and Puerto Rico, the data set gives the average daily temperature at each location for every day since January 1, 1995. For simplicity, I call this measurement just the temperature. To measure the weather changes on a day-by-day basis, I calculate at each location the average daily temperature swing. For example, if the temperature in Des Moines is 67 on Monday and 72 on Tuesday, then the daily temperature change is 5. If the temperature then drops to 50 on Wednesday, the second daily temperature change is 22. (Note that I measure the change in positive values even if the temperature goes down.) For those two days, the average daily temperature swing is (5 + 22)/2 = 13.5. For every location, the average is calculated for all days in the data set, roughly 7,300 days for each location. The figure below shows the average daily temperature swings across the United States. Greater swings are indicated by bigger plot points and with more intense reds, while smaller swings are small and green. Hawaii was calculated but couldn’t be shown well in this figure; it is tiny and green. Overall, I reach the same conclusion as Silver and Fischer-Baum: if you like predictable weather, then head towards Florida, the west coast, Hawaii, and Puerto Rico. On the other hand, if you desire excitement in your life, then the Great Plains and Upper Midwest are where you should be. Download the R source code.